This process is one that is very intuitive and intentional for me. Spontaneity is key for me when I paint. I therefore no longer paint with only brushes but also with my fingers for most of the painting. Using oil paint will always be my favourite medium as it allows for so much movement and I can come back hours or a day later and work at the same piece. I never use the colour black or grey any longer. 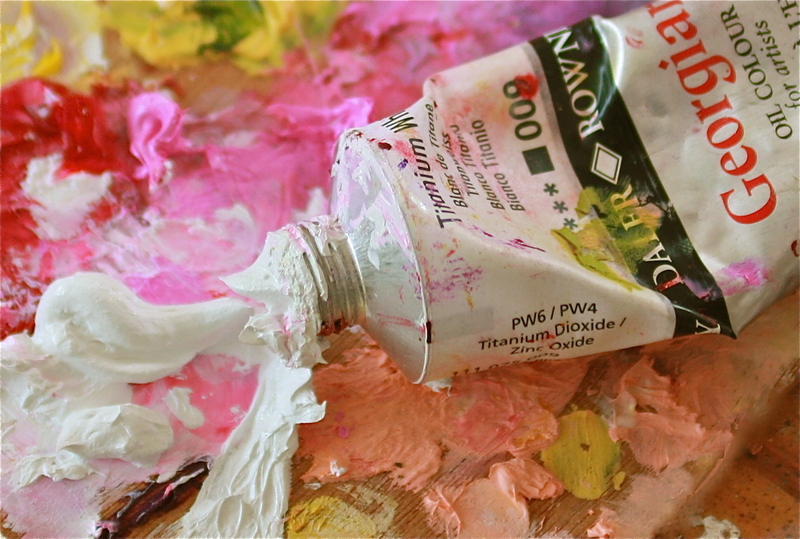 As I started searching for more light in my own life, I`ve noticed myself reaching more and more for my tube of white paint and using lots and lots of it – White carries the essence of such purity. I also no longer mix my colours on my palette like I used to. I use colour in its purest form – which is straight from the tube. 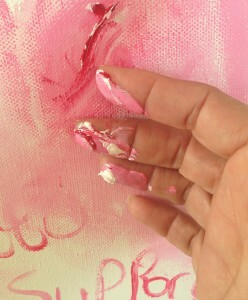 Any mixing happens spontaneously on the canvas, as my fingers spontaneously blend the colours into each other. I find that the colours are a lot stronger then and I absolutely LOVE the feel and look as they blend together on the canvas. All of this keeps me in “right brain mode”. When I begin a new painting, I stand in front of my easel, quietly aware of what I`m feeling at that moment, asking for what it is I need to place on my canvas. I begin with the emotion that is present in me that particular moment…..or an emotion I desire for myself. Here is an example of how the process of one particular painting looks: I never decide beforehand what colours to use. I allow the colours to choose me. As I face the bare white canvas, I tune in to what I am feeling and then I paint those words onto the canvas first. Afterwards I wet the canvas with turps and start moving paint slowly around the canvas, with my fingers, really feeling into what I just wrote and rewriting them as the colours blend. Then I begin the outline of the painting over these words I had just painted. Just like colour carries energy, so do words. Have you ever heard of someone saying how your words impact on your experiences – that is what I mean. I try to finish a painting a soon as I can – …. exactly because my own energy will be different in 2 days or so. If I am still working on the same painting,….. I will suddenly find the colours and the whole tone of the painting change before my eyes, carrying a totally different emotion. Some days it can feel like nothing can possibly happen on my canvas, but inevitably a colour chooses me and I begin moving the paint around. I ALWAYS feel shifted ….that is the absolute beauty and joy of painting. 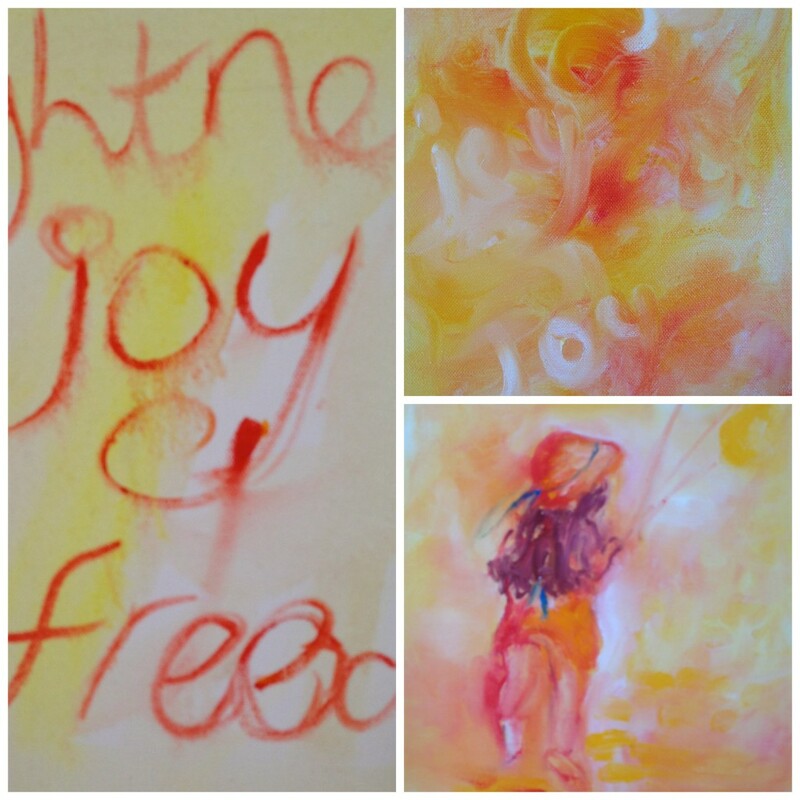 Many years ago, I did a colour therapy course and later painted with an intuitive, spiritual artist who opened my world to the energetic qualities of colour. Each colour carries certain emotive qualities, and creates a different effect on us. Think of a bunch of cheerful bright yellow roses and a bunch of soft, gentle lilac flowers. The impact on your initial response will depend on how you are feeling or what you are needing that day. Did I mention that music is always present when I paint. My studio becomes filled with the same song on repeat – much to my children’s annoyance …. but anyway … a song I choose which matches the mood of what I am trying to convey. 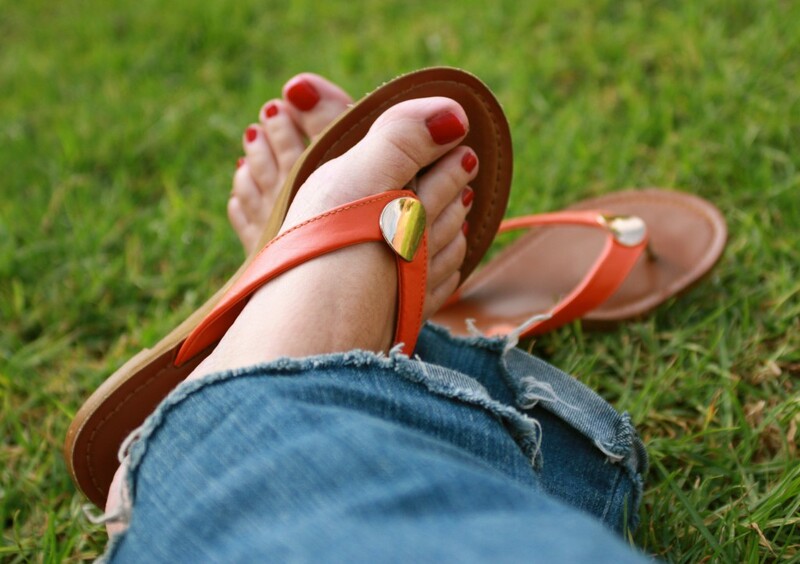 I have a favourite pair of jeans and orange pair of sandals. On days that I know it is going to be a painting day – I wear them….I really do feel like I am stepping into artist’s mode by the time I get to my easel. I really love this. Really love the fact that the jeans has no sewn hem. Such freedom…. In summer, you will find me painting barefeet a lot of the time too. I walk around our home like this, a lot, as I love feeling the earth beneath me. As much as I love the girlie, feminine look for myself…. and I really do…. I have discovered I also love this look as well…. Interesting!! !… Who would have thought? Once a painting feels like it is done, I purposely leave something imperfect if I have noticed that it “needs to be fixed”…. …..just because it’s so important for me to challenge my need for perfection…. All my life I pretty much walked a very straight and narrow road with lots of rules and “shoulds”- ….. well too much of this leaves no space for freedom, creativity, spontaneity, and….. well the Permission to be ME . because in my creative space, it’s so important for me to allow for spontaneity….. and bend as many rules as I can. This is how I create best. Often I leave and rush off as the school bell is about to ring…intending to come back and paint….then homework and other things call my attention……then I may pass my studio on the way to the washing line and hope to fit in another 20 mins or so….and then I realize that I have not, in any way, remembered to prepare for supper at all yet. ….!!!! I`m a 5am morning kind of girl – seriously it is the best, most intuitive time for me to create or just be still. So in that just woken up state, if I need to to be in front of my canvas ….. before that early morning intuition is diluted by the sound of 2 teenage boys….and their music…..
…. then those tubes need to be very available. So closing those tubes…. just don’t do it for me. I really do feel my most free and light when I have this happy joyful mess going on in front of me . but also giving myself permission on so many levels. 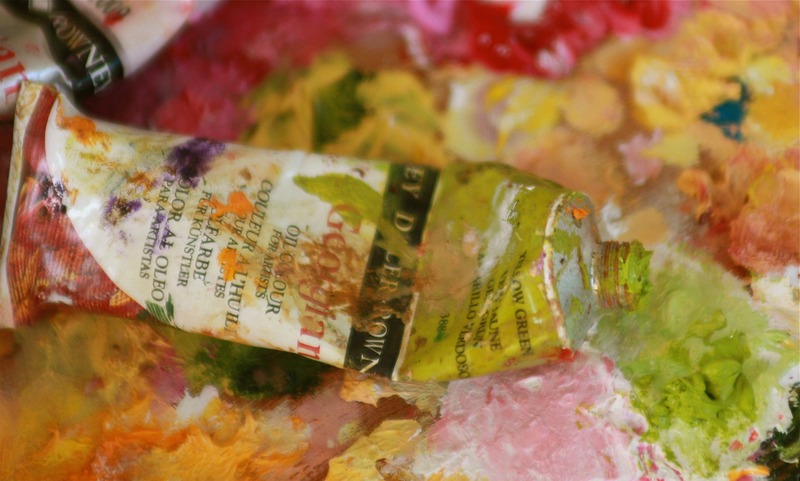 How could you unleash your creativity more? be more free…. to be an artist… to call yourself an artist… to dress more creatively…. to step into a more free spirited role, despite the conservative look you portray to others..
Or do you need to just allow ANY form of expression in your life? 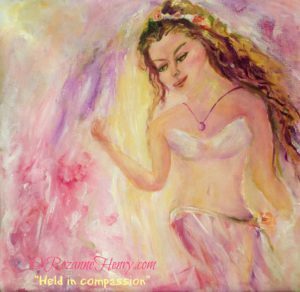 Rozanne, it’s wonderful to read this blog post and to see and feel your artist within. Wonderful!!! !